Choose a local vacant business site and make recommendations on how it may be developed for business purposes. 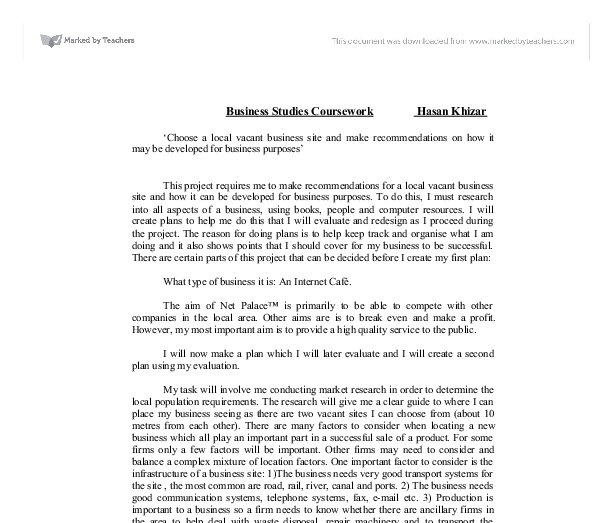 Business Studies Coursework Hasan Khizar 'Choose a local vacant business site and make recommendations on how it may be developed for business purposes' This project requires me to make recommendations for a local vacant business site and how it can be developed for business purposes. To do this, I must research into all aspects of a business, using books, people and computer resources. I will create plans to help me do this that I will evaluate and redesign as I proceed during the project. The reason for doing plans is to help keep track and organise what I am doing and it also shows points that I should cover for my business to be successful. There are certain parts of this project that can be decided before I create my first plan: What type of business it is: An Internet Caf�. The aim of Net Palace(tm) is primarily to be able to compete with other companies in the local area. Other aims are is to break even and make a profit. However, my most important aim is to provide a high quality service to the public. 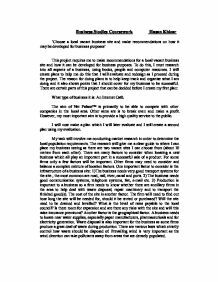 I will now make a plan which I will later evaluate and I will create a second plan using my evaluation. My task will involve me conducting market research in order to determine the local population requirements. The research will give me a clear guide to where I can place my business seeing as there are two vacant sites I can choose from (about 10 metres from each other). There are many factors to consider when locating a new business which all play an important part in a successful sale of a product. For some firms only a few factors will be important. Other firms may need to consider and balance a complex mixture of location factors. One important factor to consider is the infrastructure of a business site: 1)The business needs very good transport systems for the site , the most common are road, rail, river, canal and ports. ...read more. This is because my shop will be right next to a main road which will allow people to see any promotions, and they will be drawn to the area by a Sainsbury's Local. There is also a bus stop a few metres away from my shop which will make it easy to get to my shop. Another major advantage is that there is a bank nearby that has a cash point meaning it is easy to withdraw cash. There are some disadvantages; primarily that there is no dedicated car park, and that there are parking restrictions. The main parking restrictions are that there is no parking on certain points between 6pm and 8pm Monday-Friday. The planning restrictions in the local area are not very strict so this will help if I want to make changes to my business. There are very few social costs and there are benefits as well. The major benefit of me placing my shop in the chosen place is that this would bring people into the local area to shop which would help other local shops. How will I price? The price must be right, as people will have to buy large numbers to make profit. The price you charge can depend on what you are trying to do. I am selling pastries, tea, coffee etc as well as providing an internet service so I will have a low prices in order to attract a lot of customers and to see if my business will succeed. It is different for me as I don't sell things (apart from pastries, coffee, tea etc) to make a profit, I provide a computer service as my main way of making a profit. There are three types of pricing: #Low price-to attract lots of customers, you will have a price lower than the competition. #Average price-Your price will be the same as the competition, so you will try to get customers to go to your shop. ...read more. Promotions A promotions is not run for a very long time, they are used to help the advertising, and to get existing and new customers to buy the product. This is only ever used for a short time. The advantages of having promotions are: * Can help to boost sales when they are low * Gets people to use new products * Engorges The different kinds of promotion which will be suitable for me would be: Money off This is where you offer money off your product so to attract customers. Coupons could be used, these can be in leaflets, or come in a previous product that you buy. Another way is where there is a discount in the whole shop and no coupons are needed. The idea of these are to get the customer to use the computers. In store displays/demos This is where there is a in store demo of the product in use, or there is a special in-store displays. The idea of these is to incise the customer into buying there product. The method of promotion that I going to use is price reductions, and in-store demo's. This is because if people are using the computer for the first time, they would hopefully have some knowledge of how to use a computer and the internet. Using price reductions, such as using the internet for an hour at half price, would help to bring people back. The use of free samples, gifts, competitions are not very suitable for my shop. This is because it would be impractical to give out free samples, competitions will take a lot of time to set up and run, and gifts are not of any use as you normally only buy one of the product. I will also have special offers such as buying a coffee will give you a free extra 15 minutes to use the computer. Conclusions from action second plan. * I now know what methods of advertising, promotion, and packaging I will use * I know what benefits I will offer my customers ...read more. I think that this car would be for customers with partners or even a family. However if they do have a family it would not be practical as the car does not have much room for children and their luggage. Secondary data VsPlriinary data What is the difference? Primary data is data that is collected just for that specific purpose. While secondary data is data that was collected for a other purpose. -----------------------------------------------------------------------------------------------------------------------------------------------------1 - Advertising - Wikipedia (2004) [online] at http://en.wikipedia.org/wiki/Advertising 2 - Cyberganda Advertising - Jeanell Bertels (2005) [online] at http://www.community.k12.mo.us/webquest/bertels/quest.htm 3 - Media Awareness - Advertising Techniques (2003) [online] at http://www.entrenet.com/~groedmed/namedu/adtech.htm They are, attract the ATTENTON of your prospect; INTEREST your prospect in the product; cause your prospect to DESIRE the product and finally demand ACTION from the prospect4. The message is a very important to raise awareness for the use of condoms but to use the Pope in this way I feel is degrading and making a joke of the Catholic's beliefs on birth control. The poster is a very powerful one and to those who it does not offend it gives a very strong message to. This is because people do not normally realise they need a new television, videos, or Hi-fi until the product is made. This method has a lot of risk involved as there is no guarantee that a person will want my product. Practical Production - produce a womans magazine featuring true to life stories. I noticed during my research that this is the type of story that is featured in this genre of magazine. Real life, gritty stories that the target audience like to read because a lot of people can relate to them in someway or another. women as they are exploiting this women trying to use her to sell the underwear. The language used in the newer ad is a bit sarcastic by saying 'let's keep in touch' and also anchors the meaning on the picture.